Norske may literally translate to Norwegian, but to owner Stephen Weber of the new Menomonie restaurant Norske Kitchen and Kro, it bears an entirely different meaning. “I think ‘norske’ in this part of the world really doesn’t just mean ‘Norwegian;’ I think it means ‘that’s who we are.’ We’re all kind of a bunch of ‘norskes’ that live up here who put up with this cold weather and all this nonsense. It’s a real community. It’s wonderful for me to be back and see how people help each other,” said Weber. After lucrative jobs within the restaurant industry in large metropolitan areas, Weber decided to move back home to the quiet Midwest. Though he quickly realized he could not find restaurants in the area that were featuring scratch cooking. “I started thinking about if I were to do a restaurant in this location, what would work? What do people in this area want?” Weber said. Weber describes Norske Kitchen and Kro as “regional comfort food” but does not take full credit for developing the menu. “I really didn’t come up with the menu; I think the location came up with the menu,” Weber said. After developing recipes in his home kitchen last summer, Weber said the finished menu came after 15 revisions. However, Weber and his chefs talk every day about consistently making food taste great. The recipes continually need to be adjusted since Norske Kitchen and Kro is using fresh ingredients that can vary in taste on a daily basis. Every single item on the menu is made from scratch and many recipes are named after relatives and friends who influenced Weber throughout his life. Aunt Marge’s Deviled Eggs are named after his aunt who was “the best cook in the family.” Judy’s Potato Salad, a famous dish from his mom, and Ethel’s Point Comfort Manhattan, his grandmother’s legendary cocktail, are just a sampling of items that showcase how Weber learned to cook growing up in Menomonie and Eau Claire, Wis. He wanted to create a menu of things he wanted to eat but had trouble finding in this area. While the menu is not a conventional Norwegian or Scandinavian collection, there are items associated with the heritage. Customers can find traditional potato lefse, kielbasa and Bavarian sauerkraut plates alongside modern items such as Brat Stickers, a regional twist on pot stickers; Juicy Lucy’s, a black angus burger stuffed with cheese; and Johnny’s Pan Fried Chicken Chops with Creamy Wisconsin Gravy. Weber is enjoying watching how many people are already coming back daily. He likes to interact with his customers so he can hear people talk about the food. What are most customers talking about? Well, the fresh popovers and cream puffs, of course. 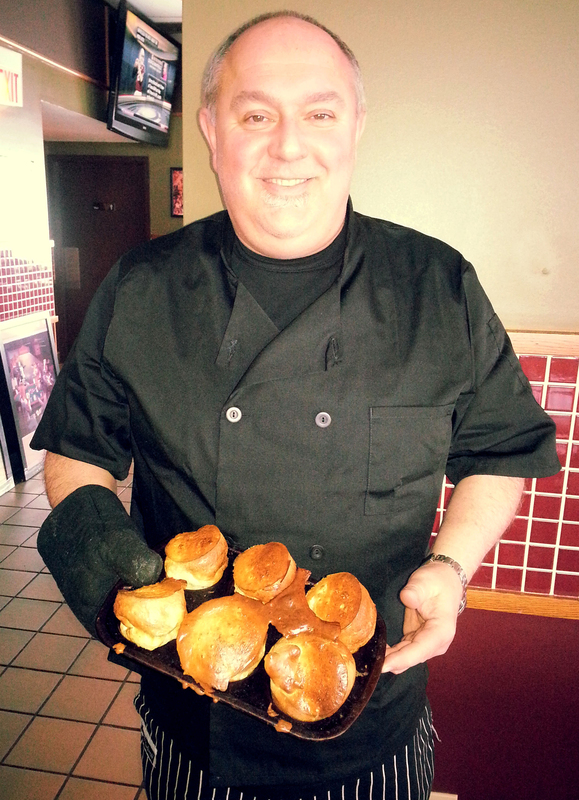 The fresh popovers have no schedule. They come to the table when they are done baking. Served in the trays straight from the oven, the eggy and puffy popovers are suggested to eat with butter and jelly, but can stand up to their reputation when simply eaten on their own. However, the sweet cream puffs come with a variety of fillings made by local baker Deb, “The Cream Puff Queen.” Each day, about eight to 12 varieties are brought into the kitchen, so there is no guarantee one flavor will still be available by the end of the night. Norske Kitchen and Kro opens daily at 7 a.m. for breakfast and is ready to serve lunch by 11 a.m. Happy Hour is from 4 to 6 p.m. and features $1.99 Brandy Old Fashioned Sweets. “I’m baffled by people who go out to restaurants and pay really good money for really mediocre food, and they do it over and over again. Our goal is to be the absolute antithesis of that. We want our food to taste good and fresh every day. From the reaction we have had so far, I think we’re accomplishing that,” Weber proudly said. Norske Kitchen and Kro is located off of exit 45 at 1705 Plaza Drive. For more information, visit Norske Kitchen and Kro on Facebook at https://www.facebook.com/Norskemenomonie2014.